The decompressor system reduces the cylinder compression at low rpm for easy starting. Decompressors systems are often used with single cylinder 4-stroke engines, but manufactures sometimes utilize these benefits on other engine configurations including V-twins. 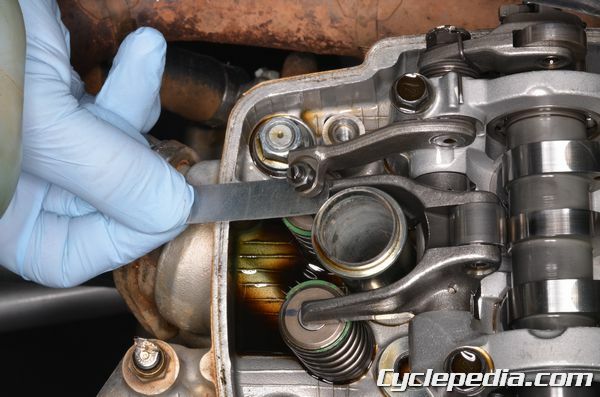 The compression is reduced by momentarily opening an exhaust valve on the compression stroke of the piston to partially vent the combustion chamber. Reducing the engine compression reduces the force required to kick start or pull start the engine, and allows the use of smaller less powerful electric starting components. Decompressor systems require maintenance and inspection to ensure correct function. Check the service manual and periodic maintenance chart of the particular vehicle for the details and specifications associated with decompression system of the vehicle. Manual decompressor systems on four stroke engines often use a cable controlled lever to apply pressure to the exhaust valve or rocker arm. The cable or lever free play must be maintained within specification. Check the free play at TDC, or as otherwise indicated by the service manual. Adjust the cable free play as needed. Automatic decompressor systems often use spring loaded weights on the camshaft to operate a pin located inside the camshaft or a special decompressor rocker arm. At rest and below idle rpm the weight/s are held in by the springs and the decompressor rocker arm or pin will contact the exhaust valve or rocker arm to release compression. When the engine starts and the camshaft is rotating at speed the weight/s will sling out. This change in position of the weight/s moves the decompressor rocker arm or pin into a position where it will not contact exhaust valve or rocker arm and the engine will have full compression. Inspect the decompressor mechanism functions smoothly and correctly as the weight/s are manually moved out to a running position and allowed to return to a resting position. If the mechanism sticks or fails to operated correctly inspect the components in more detail for condition and correct assembly. Manual or automatic decompressor systems that use a lever or decompressor specific rocker arm often use an adjustable tappet that must maintain a correct clearance with the exhaust valve or rocker arm. 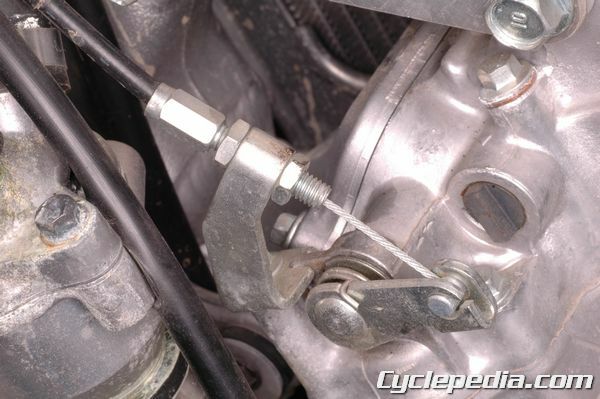 Check and adjust the clearance just as a screw and lock nut type valve adjustment. Some engines have a reverse decompressor mechanism to reduce the cylinder compression if the engine kicks back during start up. This system uses a decompressor cam that rides on the camshaft with a one-way clutch. 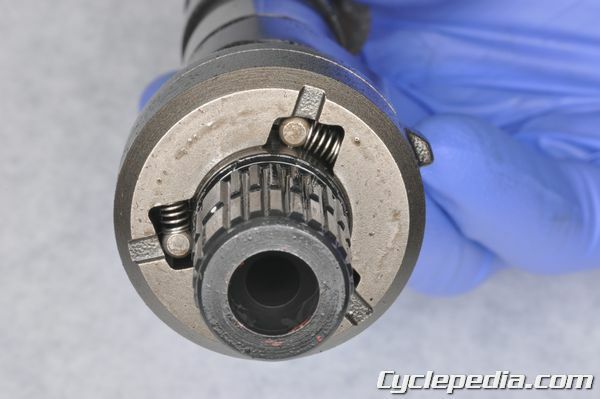 When the camshaft is turning the regular direction of rotation the reverse decompressor cam is held in place by a spring loaded stopper and the camshaft turns freely in the one way clutch. 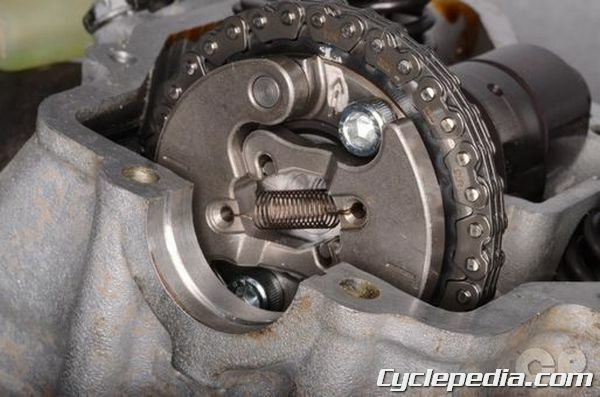 If the engine kicks back on start up and momentarily turns the camshaft in reverse, the one way clutch locks up and moves the decompressor cam with the camshaft to slightly open an exhaust valve to relieve engine compression. This reduces the strength of the kickback. When the engine begins rotating in the normal direction the decompressor cam will be halted by the stopper and the camshaft will turn freely and operate without the decompressor cam opening the exhaust valve. 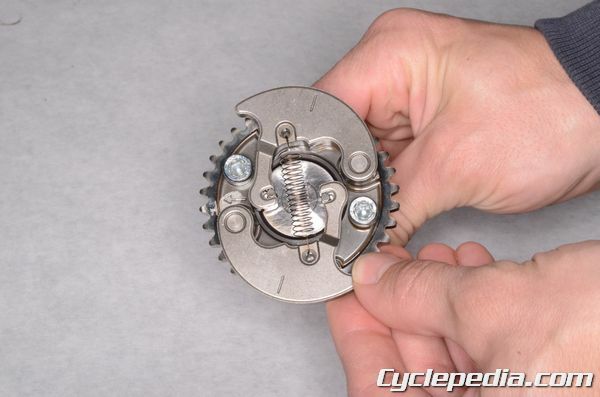 Check the function of the one-way clutch. 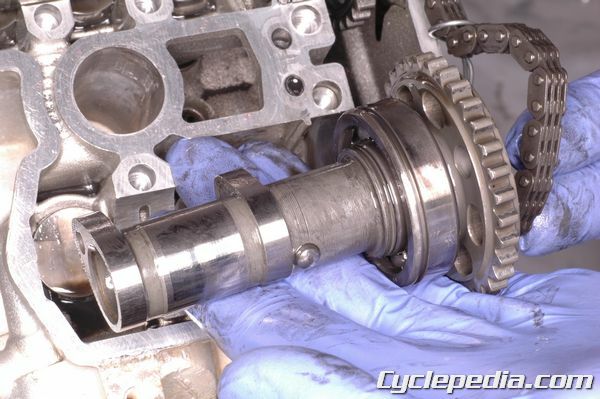 The decompressor cam should rotate smoothly in the direction of the stopper ramp, and lock to the camshaft in the opposite direction. Make sure the spring loaded stopper moves smoothly without sticking. The stopper ramp must be able to pass the stopper in one direction, but be stopped by it in the other. A poorly maintained decompression system that doesn’t release compression as it should can result in poor starting and excessive strain on staring components. A decompression system that releases compression when it shouldn’t can result in an engine that refuses to start or has poor performance. Inspect these systems to make sure they are in specification and operate correctly.